WINNIPEG - The National Hockey League season may have just ended with the Washington Capitals hoisting the Stanley Cup last week, but it’s never too early to start thinking about hockey season again. 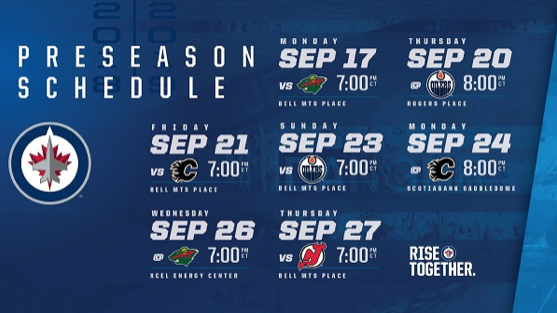 On Wednesday, the Winnipeg Jets released their seven-game pre-season schedule as they prepare for the 2018-19 season. Winnipeg will host four pre-season games and hit the road for three, welcoming Minnesota, Edmonton, Calgary and New Jersey to Bell MTS Place. The Jets kick-off their pre-season in Winnipeg against the Minnesota Wild on Monday, Sept. 17. After a road trip to Edmonton on Thursday, Sept. 20, the club returns to Bell MTS Place to host Calgary on Friday, Sept. 21 and the Oilers Sunday, Sept. 23. After a brief road trip to Calgary and Minnesota Sept. 24 and 26, the Jets return for their final pre-season tilt at home against the New Jersey Devils Thursday, Sept. 27.